Human beings always like to nourish memories. That’s why people never get tired of taking pictures. The pictures are the things that can take you to the down memory lane. 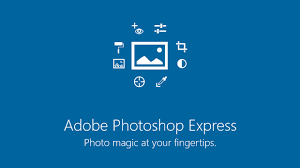 Now you will be able to capture memories in a more beautiful way with the help of Adobe Photoshop Express. It is a Flash-based image editing mobile and web application that helps to directly edit photos on social networking sites and blogs. So this app can make you free from uploading and downloading images. · Helps to fix you photos within a few minutes. Straighten, crop, Flip, Rotate, Color, Adjust or remove pet eye or red eye at once. · The easy slider controls help you to adjust hue, white balance, brightness, or more in a photo. · Enhance the fun of your photo in an artistic way like making it vibrant, glow or super punch. · Add a finishing touch with frames or borders. · Take a snap simply from the right side of the app. · View photos in their most vibrant and sharpest forms as it consists retina display. · Share a photo within a few seconds in any social media like Facebook, Instagram, Twitter or Tumblr. Adobe Looks Pack- The pack consists more than 20 unique styles to capture a photo. You can try the styles before purchasing the app. Hence, it will be right to say that this very app is able to make your memories brighter, sharper and more vibrant. All you need to do is to install the app from the Google Play Store and you will be able to discover a new way of photography. No matter, whether it is day or night, a sunny day or a gloomy one, with Adobe Photoshop Express, you will be always able to capture the moments with your friends and families.